This Directive (FSD 2014-01), which is in response to recent incidents, require grounding systems for truck and rail loading and unloading activities at the bulk plant. Since 2010, the B149.1 Natural Gas and Propane Installation code requires propane and natural gas systems to be bonded. This article, which first appeared in the Mar/Apr 2013 edition of Propane Canada magazine, discusses how bonding of the gas system is achieved and includes key definitions related to bonding. Since writing the article entitled “The Need for Bonding of Corrugated Stainless Steel Tubing (CSST) Systems”, which first appeared in the Jan/Feb 2013 edition of Propane Canada magazine, I’ve had several requests for additional information explaining how one actually goes about bonding propane and natural gas systems. When the 2010 CSA B149.1 Natural Gas and Propane Installation Code was published and adopted by provincial regulation, the bonding of propane and natural gas piping systems became a requirement of the Code. Connected to establish electrical continuity and conductivity. A reliable conductor to ensure the required electrical conductivity between metal parts required to be electrically connected. Connected (connecting) to ground or to a conductive body that extends the ground connection. A conductor used to connect the system grounded conductor or the appliance to a grounding electrode or to a point on the grounding electrode system. Electrodes can be a metal rod/pipe/plate driven into the ground; the metal frame of a building; buried metal or copper water line into the building; a ground ring of copper wire; or a concrete encased foundation electrode. 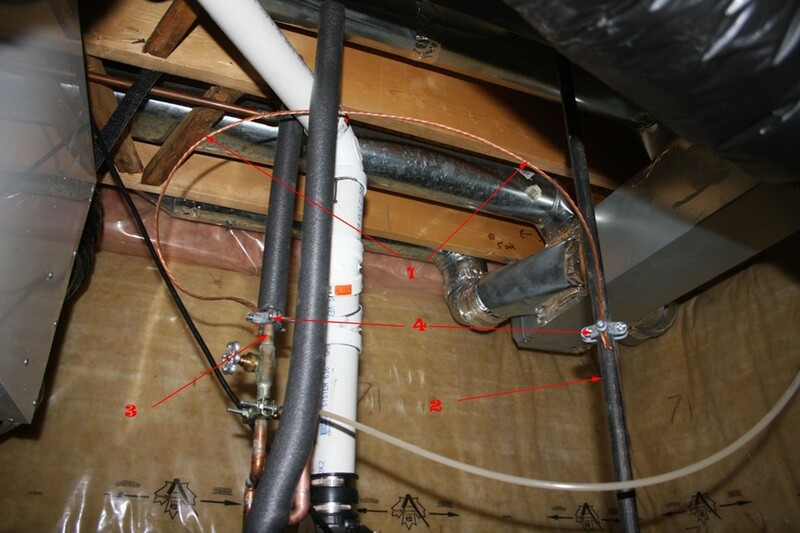 Clause 4.7.3 of the Code requires that all interior metal gas piping that may become energized must be made electrically continuous and bonded in accordance with the requirements of the local electrical code or, in the absence of such, the Canadian Electrical Code, Part 1. The 2012 Canadian Electrical Code Clause 10-400 (4) has the same wording as clause 4.7.3 in the CSA – B 149.1. Clause 6.14.6 of the Code does not permit propane and natural gas piping or tubing to be used for an electrical ground. The clause states that an electric circuit cannot utilize piping or tubing in lieu of wiring, except for a low-voltage control circuit, ignition circuit, or electronic flame detection device circuit incorporated as part of an appliance. The Canadian Electrical Code requires the house’s electrical system have a connection to earth to provide for its safe operation. When other systems are connected to the electrical system and its grounding, those systems are “bonded” to the electrical ground. 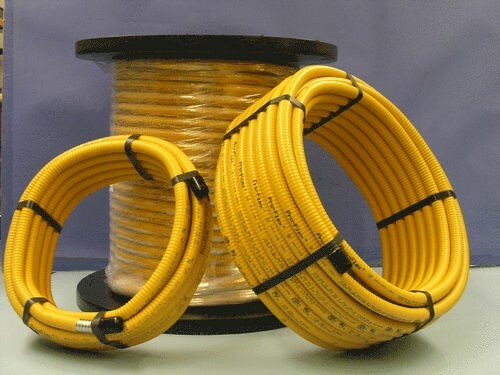 Bonding is provided primarily to prevent a possible electric shock hazard for persons coming into contact with the gas piping and other metal objects that are connected to the grounding system, but which may be energized at a different level of electrical potential. Gas piping can become energized by an electrical fault in the branch circuit of a gas appliance connected to the piping system. Nearby lightning strikes can also result in an unbalanced voltage build-up and a resulting high electrical potential difference. An electrical bond is an intentionally installed electrically conductive and continuous path from the gas piping to the grounding electrode system. The systems that are bonded to the electrical system will have roughly the same electrical potential, so that if energized, they will all be energized at the same rate and at the same speed. Thus, when the electrical system and the bonded systems are energized by an electrical fault or lightning, the possibility that the electrical energy will arc or jump from one system to the other is reduced because all those systems are at an equal electrical state. A bonding wire from one metal component to another allows stray electricity to equalize through the wire so that one metal component will not have a greater voltage in it than another metal component, preventing arcing between the two metal components. However, if metal systems in the house are not bonded to the electrical ground, they will have a different electrical potential from other conductive systems in the house. In the event those systems are energized by a high voltage event like lightning, then it is possible that the electricity being conducted and travelling on one metal system may come to a point where it is close to an adjacent metal system that offers a lower resistance or impedance path to ground. It is possible that if the energy has enough voltage, it may jump over the air gap between the two adjacent metal systems, and use the second path to go to ground. When the energy jumps that air gap, it generates an electrical arc that has a high voltage. Photo #1 provides an example of grounding the house’s electrical system. The copper underground water service that runs from the water main in the street to the house acts as the in-situ grounding electrode. Photo #1 – 1) Underground water service line at entrance to house. 2) Bare grounding wire connecting electrical panel & water line. 3) Grounding clamp attached to water service line. 4) Water service shut-off valve. 5) Water meter. Bonding is achieved by installing a wire of sufficient size from the bonded component to the electrical system ground. Equipotential bonding is achieved when all metallic systems in a structure are bonded to the electrical system ground. Minimum bond wire should be a number 6 AWG copper wire. The bonding clamp must be attached such that metal to metal contact is achieved with the steel pipe component. Remove any paint or applied coating on the pipe surface beneath the clamp. As discussed in my previous article on bonding of Corrugated Stainless Steel Tubing (CSST), the bonding clamps must be attached to the brass fitting, to a steel manifold or to a rigid pipe component attached to the CSST. The corrugated stainless steel portion of the tubing system must not be used as the bonding attachment. Photo #2 – 1) Bare bonding wire. 2) Steel propane/natural gas piping. 3) Copper wire line to water heater. 4) Bonding clamps. 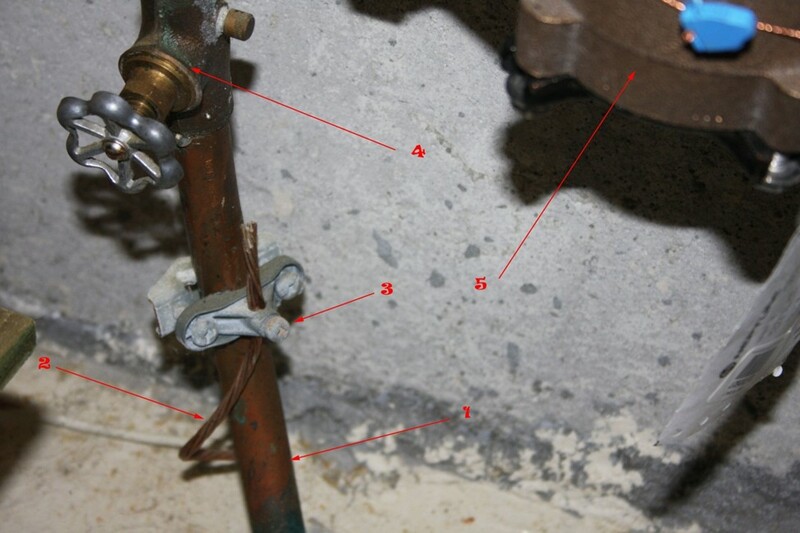 Photo #2 above, shows the bonding wire attached to the steel gas piping and the copper cold water line feeding the water heater. The bonding connection is by mechanical clamps. UL-467-approved bonding clamps can be used. Under no circumstances is any underground natural gas utility service line or the underground supply line from a propane storage tank to be used as a grounding electrode because grounding electrodes are intended to carry large currents. This can expose the piping to the possibility of sparking which can create a hazardous condition if the service piping is undergoing any type of maintenance. Corrugated Stainless Steel Tubing (CSST) has become a popular material for gas installations. This article, which first appeared in the January/February 2013 edition of Propane Canada magazine, discusses the importance of bonding (CSST) systems to avoid electrical arcing which could perforate the tubing. I have recently been retained to investigate two incidents where it is believed that unbounded Corrugated Stainless Steel Tubing (CSST) has been subjected to electrical arcing, resulting in the wall of the CSST being perforated. The leaking propane was ignited by the electric arc that perforated the tubing wall. The resulting fires caused extensive damage to the structures in which they were installed. I would, therefore, like to take the opportunity in this article to raise awareness of the need for bonding of CSST gas systems. The material requirements for tubing first listed CSST in the 2005 edition of the CSA/BI49.1 Natural Gas and Propane Installation Code. The previous codes and editions contained a clause that permitted the use of materials not specified in the Code if they conformed to a nationally recognized standard or to a test report of a nationally recognized certification organization. Information on file indicates that CSST has been installed in Canada since at least 1998. This was prior to the bonding requirements being put into the manufacturer’s installation instructions and training programs. Each manufacturer of CSST requires that a certified propane technician take an installation training program, which is required as part of ANSI LC 1-2013 / CSA 6.26-2013, Fuel Gas Piping Systems Using Corrugated Stainless Steel Tubing. The training courses are to ensure that only qualified propane technicians install CSST. The training requirement will also prevent CSST from being available at home improvement stores. In Canada, CSST is certified by ANSI LC 1-2013 / CSA 6.26-2013, Fuel Gas Piping Systems Using Corrugated Stainless Steel Tubing. CSST consists of stainless steel corrugated tubing that may or may not be sheathed by a polymer conformal coating. Each manufacturer appears to have developed their own system for achieving couplings/connections. The flexible tubing comes in 100-foot rolls that can be cut to length, and be bent and conformed by hand, allowing for quick and easy installation with a limited number of connections. Simple economics have contributed to CSST popularity since its introduction in 1997; the product is less expensive and requires far less time and skill to install. CSST tubing cuts easily with a standard tube cutter and requires no threading or welding, and no special tools to seal the fittings. The CSST gas line also weighs far less than rigid gas pipe and is less bulky to store, transport, and handle. During the installation process, the flexible CSST product can make turns without the need for installing threaded and sealed pipe elbows. The CSST gas line is extremely thin, with walls typically around 0.008″ in thickness. Black iron gas pipe is typically 0.12″ thick, making the walls of black iron pipe 15 times thicker than the walls of CSST tubing. Conversely, the amount of electrical energy needed to perforate the wall of traditional black iron pipe is about 15 times more than the energy needed to perforate the much thinner walls of CSST tubing. The thin wall thickness, required to permit easy routing of the tubing, has resulted in a material that is easily punched through by electrical arcing. Once the tubing has been perforated, it is possible for the escaping gas to be ignited by the arcing process or by adjacent open flames. One manufacturer’s installation instructions state that although the tubing provides significant advantages over more rigid gas delivery systems, its wall dimensions may make it more likely than steel pipe to be punctured by a nail or other sharp objects, or damaged by other extraordinary forces such as a lightning strike. It is well known that lightning is a highly destructive force. Therefore, the user must ensure that the system is properly bonded and grounded. In order to maximize protection of the entire structure from lightning damage, the user should consider installation of a lightning protection system. The installation instructions go on to require that the gas tubing system be bonded to the electrical earth grounding system of the structure through the use of a bonding clamp and wire. The section further states that “proper grounding and bonding may reduce the risk of damage and fire from lightning strikes. Even a nearby lightning strike that does not strike a structure directly can cause systems in the structure to become energized. If the systems are not properly bonded, the difference in potential between the systems may cause the charge to arc to another system. Arcing can cause damage to C55T. Correct bonding and grounding should reduce the risk of arcing and related damage”. One other possible cause of electrical arcing perforating the CSST is a failure of the structure’s electrical system, resulting in the wiring’s protective coating being damaged, exposing the bare wires to the CSST. In this type of scenario, the resulting ignited propane leak would not be the primary or secondary cause of the structural damage but a third result of the fire origin. The fire origin could have been started by the electrical wiring or a source that resulted in the fire origin compromising the electrical wiring system within the building. The house’s electrical system must have a connection to earth to provide for its safe operation. When other systems are connected to the electrical system and its grounding, those systems are “bonded” to the electrical ground. Bonding is achieved by installing a wire of sufficient size from the bonded component to the electrical system ground. Equipotential bonding is achieved when all metallic systems in a structure are bonded to the electrical system ground. The systems that are bonded to the electrical system will have roughly the same electrical potential, so, if energized, they will all be energized at the same rate and at the same speed. Thus, when the electrical system and the bonded systems are energized by lightning, the possibility that the lightning energy will arc or jump from one system to the other is reduced because all of those systems are at an equal electrical state. A bonding wire from one metal component to another allows stray electricity to equalize through the wire so that one metal component will not have a greater voltage in it than another metal component, preventing arcing between the two metal components. However, if metal systems in the house are not bonded to the electrical ground, they will have a different electrical potential from other conductive systems in the house. In the event those systems are energized by a high voltage event, like lightning, then it is possible that the electricity being conducted and traveling on one metal system may come to a point where it is close to an adjacent metal system that offers a lower resistance or impedance path to ground. CSST bonding requirements provide an effective electrically continuous path in an effort to conduct stray voltage/current safely to the ground. The bonding point must be in close proximity to the electrical panel as practical. The wire gauge for this bond must be sized, at a minimum, for the full amperage available through the electric service. For attachment to the CSST, bonding clamps must be attached to the brass fitting, to a steel manifold or to a rigid pipe component attached to the CSST. The corrugated stainless steel portion of the tubing system must not be used as the bonding attachment. CSST or other gas piping system components must not be used as a grounding electrode or as a grounding path for appliances or electrical systems. One manufacturer, Omegaflex, has developed a CSST product called “Counterstrike”, which is specifically designed to dissipate the energy from electrical arcing by enclosing the flexible tubing with a proprietary jacket (black in colour), made from a material which is both thicker and conductive. The product is designed to spread the electrical energy over the entire length of the run, allowing it to dissipate rather than concentrate at anyone point on the CSST. In theory, at least, this should reduce the potential for breaching of the gas line during instances where the CSST is energized by an electrical source. Counterstrike’s installation instructions still require bonding to a ground. In conclusion, it is imperative to read and follow the manufacturer’s installation instructions to make sure you are installing the CSST properly and that you have followed the manufacturer’s installation instructions to reduce the likelihood of electric arcing damaging the CSST.